The American Military cemetery in Margraten, Netherlands, where David McGhee's grandfather, Sgt. Willie F. Williams, is buried. Effie Payne kept that blue leather and denim suitcase under her bed. She was the only person who knew what was inside it. Not even her three children had a clue. Effie rarely talked about her husband. Being an only child, David was often in his own world, and his curiosities didn't emerge until well after Effie's death about 20 years ago. When his grandmother died, it was hard. "It was very emotional," he said. "My grandmother and I were very close." There was one thing he wanted when she passed — that suitcase. But it sat in his basement, gathering dust, for over a decade. "I had to be emotionally ready to open this up," he said. Eventually, when he developed an interest in genealogy, there was no question in his mind where he would begin. David McGhee holds up an award given to his grandfather, Sgt. Willie F. Williams, for his military service in World War II. When he unzipped the suitcase, the first thing that hit him was the smell — old papers and photos and random ephemera had developed a strong, musty odor. It reminded him of its age, and its potential meaning. Inside sat a treasure-trove of information about David's grandfather, Sgt. Willie F. Williams. Williams had served in Europe during World War II, and died in Germany, years before David was born. Nobody ever talked about him, including David's grandmother. "This suitcase was started with documents that were sent to her from the military and it continued to grow until the date of her death," David said. There were photos, commendations and medals. There were Western Union telegrams, including the one sent to her upon her husband's death. David's grandfather had remarkable penmanship. During his service, he drew cross-sections of German bombs and meticulous trekking maps. 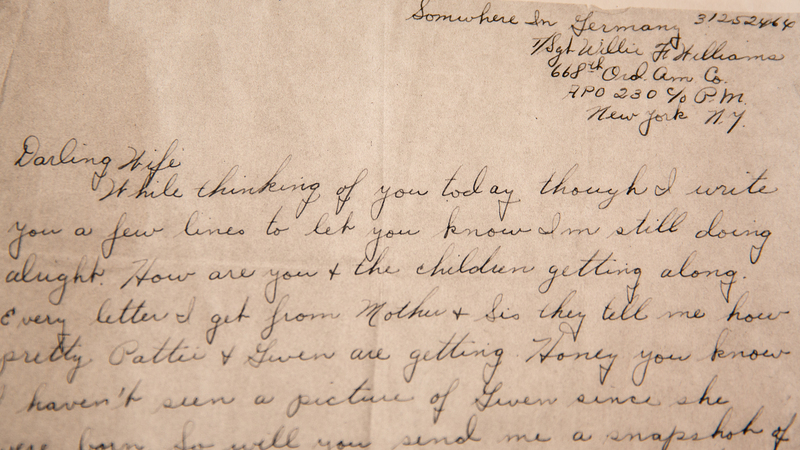 The suitcase also includes a handwritten letter — in perfect cursive — from Sgt. Williams to his wife, from "somewhere in Germany." A letter written by Sgt. Willie F. Williams to his wife Effie from "somewhere in Germany" during World War II. The letter was found in a suitcase never opened by anyone but Effie. The records in that suitcase showed David that his grandfather had served in an African-American unit, managing ammunition and explosives. David also learned that he died in an explosion. 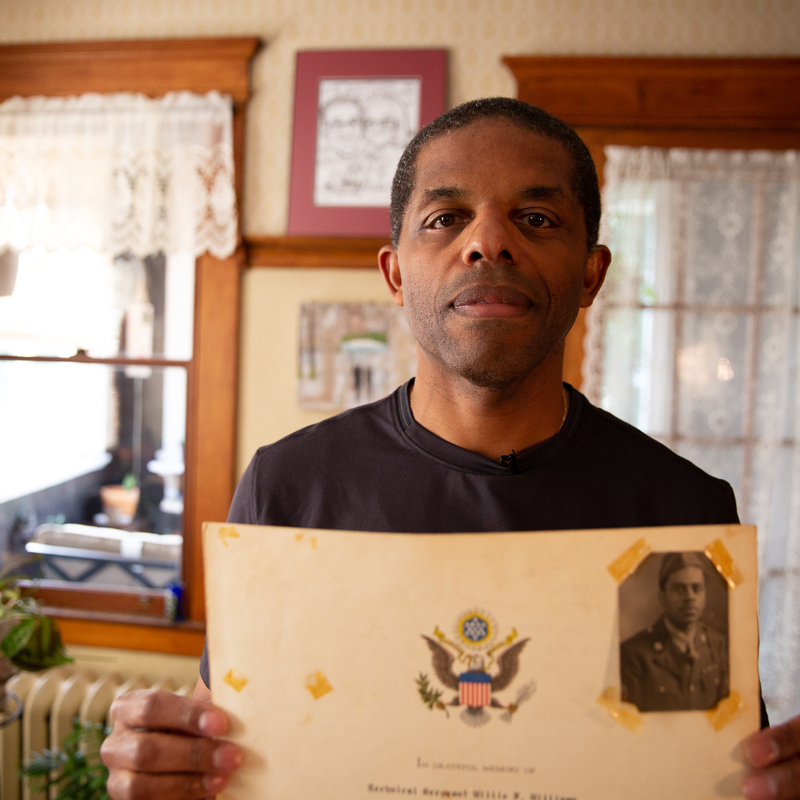 David McGhee went on a voyage of discovery when he finally opened his grandmother's suitcase, full of mementos of her husband who died in World War II. But one thing the suitcase didn't tell him? Where his grandfather was buried. So he turned to more modern research tools — the Internet. It wasn't long before he and his wife were on a plane, flying nearly 4,000 miles across the Atlantic Ocean, on Memorial Day, to the Netherlands. At the American Military Cemetery in Margraten, large oak trees flanked a path that wound through a sea of crosses and stars of David. An American flag waved in the distance. Among the dead buried here are 172 African-American soldiers, killed during World War II. Americans helped liberate the Netherlands from the Nazis in 1945. On a warm, fall day, historian Mieke Kierkels was looking for one specific grave. She walked between the headstones and, minutes later, found the one she was looking for. "We are standing in front of the gravestone of Willie F. Williams," Mieke said. "David McGhee's grandfather." Sgt. Williams (whose name is also spelled Willy F. Williams in some records) was killed in June of 1945, and buried in Margraten. That was the little known piece of history discovered when David turned on his computer, and typed in his grandfather's name. He found a website called Black Liberators of the Netherlands — it was Mieke Kierkels's project. She started the site to learn about the black soldiers buried there. Military records have a code to indicate the soldier's race, but beyond that, there's not much else Kierkels could learn about the buried soldiers. It's hard to get more information because a lot of records were kept by veterans organizations, and most didn't allow black members in those days. "People should know that history keeps out things that are not fitting in at the time the history is written," Mieke said. Her website lists the soldiers' names and where they're from, but Kierkels wants their stories. She's only been able to get information on a handful of them. David's suitcase, though, offers a window to one soldier's story, so at least his service won't be lost to history. "You have to really understand the African American experience to know that part of the history is missing," David says. "And that's why this project is so important to me, because it's now being told." In the Netherlands, these stories are also being kept alive. David's grandfather's grave has a caretaker — a local couple, Jan and Jos Smeets. They never met Sgt. Williams, but they visit the site on special occasions and lay flowers. When they die, their daughter will take over. All 8,301 American graves in Margraten are adopted by Dutch families. It's something David never expected to find. "To know that Jan and Jos Smeets have been tending to his grave and knowing that others are being tended to the same way — it's hard to put into words," he said. When David visited Smeets's home, he found a framed photo of his grandfather, Sgt. Willy Williams, on display next to the Smeets's own children. It was as if he was family. "To go into a foreign country and be greeted by family? It's amazing," David said. And now we have a story about a young African-American boy who grew up with two mysteries. One was his grandmother's old suitcase. It was full of stuff she shared with no one. The other mystery was about the boy's grandfather, who died before he was born. The boy grew into a man, and the suitcase became his after his grandmother died. When he opened it, his journey of discovery took off. Connecticut Public Radio's David DesRoches picks up the story here. DAVID DESROCHES, BYLINE: Effie Payne was the only person who knew what was inside that suitcase. Not even her three children had a clue. But one day, her grandson, David McGhee, about 9 at the time, got a glimpse. DAVID MCGHEE: She was actually going in for something else. But I saw that picture. And I asked, what was it? And it was her mother and her father. And it just disappeared. DESROCHES: She zipped up the suitcase, wouldn't say anything else about it. She died about 20 years ago, and David got that suitcase. But it sat in his basement, gathering dust for years. MCGHEE: I had to be emotionally ready to open this up. And so at some point years later, I opened it up. DESROCHES: When he opens the blue, faded leather and denim suitcase, it hits you. MCGHEE: It has that musty smell to it. DESROCHES: Inside is treasure - not gold and silver but something else, something priceless. MCGHEE: Here is something that came from President Truman at the time in regards to his service. DESROCHES: The suitcase is full of information about David's grandfather, Sergeant Willie F. Williams. He'd served in Europe during World War II, died in Germany years before David was born. And nobody ever talked about him, including David's grandmother. MCGHEE: This suitcase was started with documents that were sent to her from the military. And it continued to grow until the date of her death. DESROCHES: There are photos, commendations and medals, Western Union telegrams. His grandfather had penmanship that bordered on artistry. He drew cross sections of German bombs and meticulous trekking maps. MCGHEE: Here's that map tracing his route from Belgium into Germany. DESROCHES: He folds up the map, then pulls out a handwritten letter. Sergeant Williams wrote it to his wife from somewhere in Germany. DESROCHES: David learned that his grandfather served in an African-American unit managing ammunition and explosives. David also learned that he died in an explosion. But one thing he didn't learn - where his grandfather was buried. So he turned to more modern research tools - the Internet. It wasn't long before he and his wife were on a plane flying nearly 4,000 miles across the Atlantic Ocean on Memorial Day. On this warm, fall day in the Netherlands, historian Mieke Kierkels walks through the American Military Cemetary in Margraten. It's a city a few miles west of Germany. Large oak trees flank the path as she winds through a sea of crosses and Stars of David. An American flag waves in the distance. MIEKE KIERKELS: There are leaves on the grass. And that's all in between 8,301 marble gravestones. DESROCHES: Among the dead are 172 African-American soldiers killed during World War II. Americans helped liberate the Netherlands from the Nazis in 1945. Mieke's looking for one specific grave. KIERKELS: Here is the number of the plot. Yes, this is the right one. DESROCHES: She continues walking between the headstones. Minutes later, she finds the one she's looking for. KIERKELS: We are standing in front of the gravestone of Willie F. Williams, David McGhee's grandfather. DESROCHES: Sergeant Williams was killed in June of 1945 and buried here in Margraten, a little-known piece of history that David discovered when he turned on his computer and typed in his grandfather's name. He found a website called Black Liberators of the Netherlands. It was Mieke Kierkels' project. She started the site to learn about the black soldiers buried there. Military records have a code to indicate the soldiers' race. But beyond that, there's not much else Mieke knows about them. It's hard to get more information because a lot of records were kept by veterans' organizations, and most didn't allow black members in those days. KIERKELS: People should know that history keeps out things that are not fitting in at the time the history is written. DESROCHES: Her website includes the soldiers' names and where they're from, but Meike wants their stories. She's only been able to get information on a handful of them. David's suitcase, though, offers a window to one soldier's story, so at least his service won't be lost to history. MCGHEE: You have to really understand the African-American experience to know that part of the history is missing. And that's why this project is so important to me, because it's now being told. DESROCHES: In the Netherlands, these stories are also being kept alive. David's grandfather's grave has a caretaker, a local couple, Jan and Jos Smeets. They never met Sergeant Williams. But they visit the site on special occasions and lay flowers. And when they die, their daughter will take over. 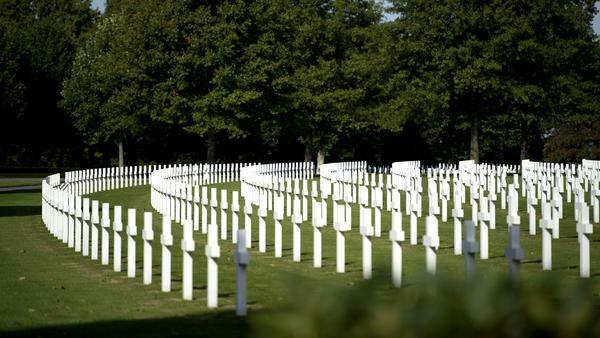 All 8,301 American graves in Margraten are adopted by Dutch families. It's something David never expected. MCGHEE: To know that, you know, Jan and Jos Smeets have been tending to his grave and knowing that others are being tended to the same way is - it's hard to put into words. DESROCHES: When David visited the Smeets' home, he found a framed photo of his grandfather, Sergeant Willie Williams, on display next to the Smeets' own children as if he were family. For NPR News, I'm David DesRoches in Hartford. (SOUNDBITE OF TAPE'S "A SPIRE") Transcript provided by NPR, Copyright NPR. This month marks 10 years since Connecticut first granted marriage licenses to gay and lesbian couples. This hour we talk about the work that led up to a historic ruling from the state Supreme Court and we learn how LGBTQ rights have advanced in recent years. Were you one of the couples that finally got to tie the knot in 2008?